Info "I'm the referee here! Return the balls!" 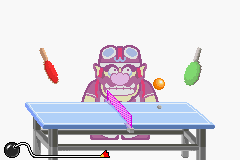 Ping-Pong Panic is one of Wario-Man's microgames in WarioWare: Twisted! The player must tilt the Game Boy Advance to return the ball. Level 1: The player must return 1 ball. Level 2: The player must return 2 balls. Level 3: The player must return 3 balls.